Our recent visit to Zucchini's Restaurant, will not be our last. We arrived just as the lunch service was winding down and were pleasantly greeted and seated, As we looked around we couldn't help but notice all of the wonderful changes the restaurant received during its remodeling and re-opening under new ownership a few years ago. Many of us remember it from the days when it was the North End Restaurant. It closed for some time and re-opened as Zucchini's Restaurant & Catering, and what a great improvement from the past. There were two in our party and we decided to start off with an order of their popular "Spicy Wings" which are served with the traditional Blue Cheese Dressing, Celery and Carrots. The wing choices may be limited at Zucchini's, with just two flavors Spicy and Teriyaki, but both are amazing and loaded with flavor. We have had them both and they were a big hit with us during our "Wing Review" a couple years ago. For our main course we both decided on one of their Daily Specials, the Panini Sandwich, one French Dip and the other a Reuben, both cooked to perfection with great grill marks and ingredients. One of us ordered regular fries and the other sweet potato. The traditional regular fries were crisp and served hot, but the sweet potato fries were 5 Star all the way. In fact, I'll go out on a limb here and say, they may be the best sweet potato fries we have ever eaten. If for no other reason than these amazing fries, put this place on your "must go" list. Remember to try the pizza, which is cooked in a wood-fired oven. 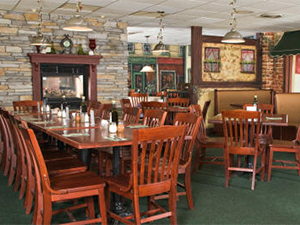 The atmosphere was good, staff excellent, there was a nice selection of Daily Specials to choose from. Overall we would urge you to give Zucchini's try if you have never been before. FYI, there lounge is warm and inviting, and there is plenty of FREE Parking on-site, which is always a big plus with us.